New faces from the exhibition at the National Museum Gallery are commendable from January 26 to February 4, 2019, with more than half a hundred artists and hundreds of artworks of caligrafers. New faces from the exhibition at the National Museum Gallery are commendable from January 26 to February 4, 2019, with more than half a hundred artists and hundreds of artworks of caligrafers. Beginning in the hands of Bangladeshi artists Saiful Islam, the art of coloring and solo exhibition of painting in Bangladesh. But it was not the movement or the art awakening. The first person to fall in the field of art movement is named Artist Cartoonist Ibrahim Mondal. We shook hands with some young artists and poets in hand. That's about the decade of the last century. 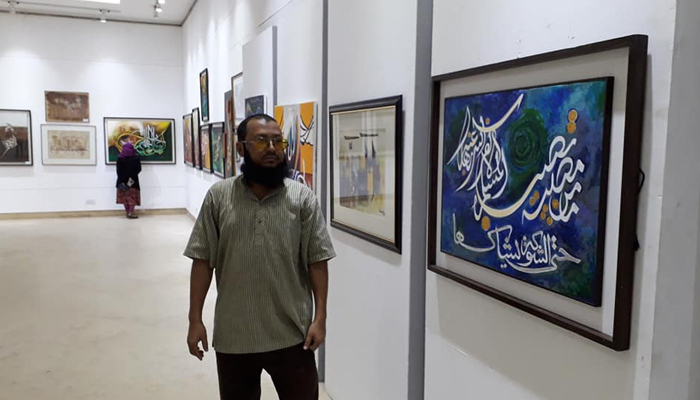 They are organized the Bangladesh Caligraphy Society to provide training for the youths in caligraphy, workshops and routine junky caligraphy classes, and the artistic artistic endeavors are the foundation of today's artwork. Ibrahim Mandal was the convenor of about a dozen national caligraphy exhibitions since the 90's, and I have been the only Khadem in the organizing committee of these exhibitions. Our main objective - to establish the Caligraphy industry in its dignity and to re-present the Bangladesh's calligraphy in its own identity in the world. They know that the calligraphy of Sultanatei was internationally recognized and well known, our Bengal Tughra and Bahari style attracted so many of the Mamluk Sultans of Egypt so much that they themselves began to practice caligraphy in Bengal Tughra. In our time, our glorious art has stirred our generation again, the religious people of Bangladesh have adopted this art as the auspicious of their own soul. It is commendable that the initiative taken to promote the art of meliora foundation caligraphy, and with the sole intention and interest of Syed Saifuddin, from the year 2013, 10 events have seen success. In this event, Ibrahim Mondal and I have extended all the support of cooperation without ignoring any internal barriers. Sincere thanks and blessings to our beloved Dear Saifullah Safa, he has worked hard and gathered the artists, the reality is that the participation of artists in the event of the Maini Foundation is done through Safar because the artists are not familiar to anybody in the Mainia Foundation, but at the gallery there are also people who are in reception with the artists. It does not have any kind of respect, it is very sensitive. Foundation Chief Syed Saifuddin Saheb is a very decorated and dignified person, hoping he will keep an eye on the respect of artists. The work of the new and new artists is lively in this year's exhibition, the excitement of creating their work. 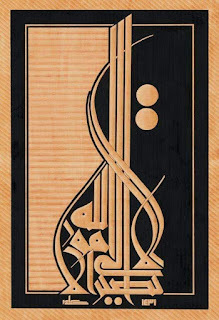 They started their journey in the calligraphy, hoping that everyone will take their identity quickly, ask for advice from the elders, and as soon as possible copy and copy, make yourself a calligrapher, why would the Khamas spend their hard-earned money in the end and waste the future as another Kamala. By performing the work of young and talented artists of this exhibition means carrying signatures of skill. Shakila chooses, Sadiyasaha sisters' work is expected of us. Young Usama, Mustasim and other younger brothers will go on the path of light, like the Caligraphy Craft of Bacchu Dhar Pal. Our elder sister Ferdous Apa tried to write the Qur'an on Caligraphy form in Calcutta style, with a tireless half-time tone of her half-life with the juice of her Mehdi leaf, is comparable. Caligraphy paintings with her specialty Mehndi leaf juice. The work of friend Al Maruf and Amin Bhai is like a spiritual pursuit. Friend Emerul gave two new jobs in his own form. 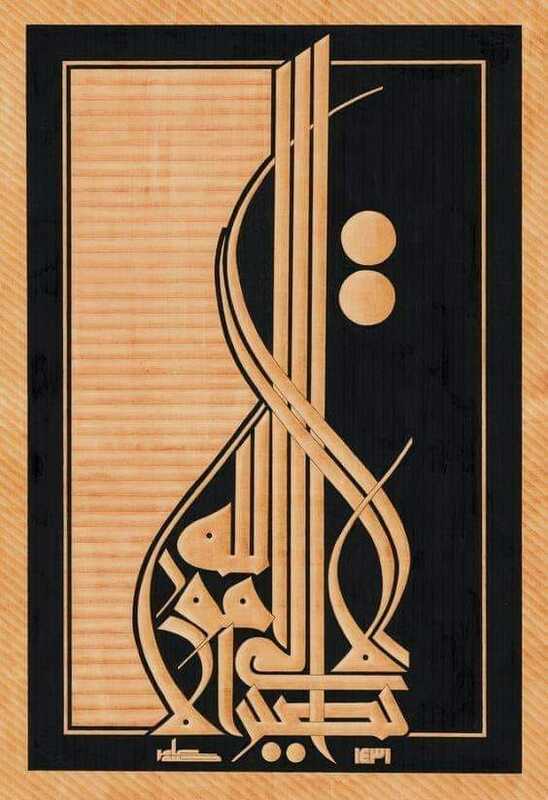 Arif brother made a clean and colorless calligraphy in a neat way, which made him special. His works presented in the exhibition carry the consistency. One of the issues related to this, in Bangladesh, basic work in mosque calligraphy has been done mainly by three people, Amilul Islam Amin through tiles, Arifur Rahman with ceramic plates and glass pieces, and Marbell Inle and I am under the influence of Abdur Rahim. One thing is to say, Mural Haque has done a lot of work with Arabic design and caligraphy cutting tiles, has given some caligraphy work in this exhibition, all of which are not copies of its own. In it, my masterpiece and friend Moroccan's famous calligrapher Ben Zaddu Amer has copies of work, the job signature was dropped. Besides, it has been good to see the presentation, sincerely sung by participants, thanks to the Mainia Foundation, the goal of the calligraphy industry to go forward, all this expectation, all this hope.